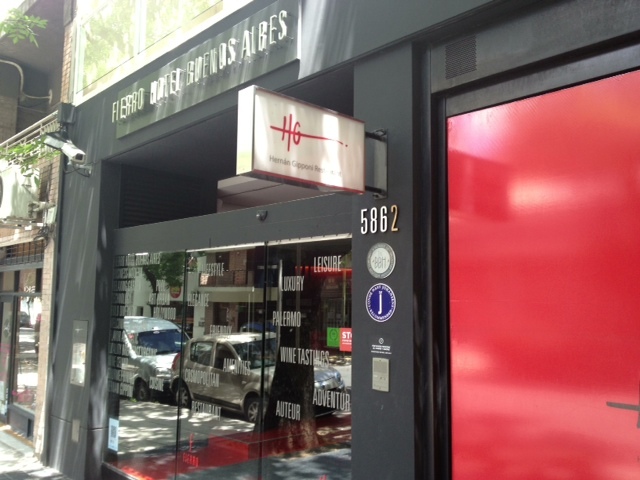 Since I’ve been staying here, a restaurant has kept coming up when asking various servers, chefs and people I’ve met as to a place I needed to go before I left – Hernan Gipponi Restaurant. I decided to change things up a bit and have my big meal for lunch and combined with the perfect weather, it seemed like a great time to try it. The restaurant is part of the boutique Fierro Hotel, built 3 years ago and labeled as a “hotel for gourmets.” It’s also only 4 blocks from me so it was a very easy walk. The building was pretty easy to spot with a bright red sign and sleek glass doors. I walked through the small but sleek lounge and lobby to the back of the main floor, which led to the restaurant. It was a fairly typical restaurant layout – banquets, comfortable chairs with the nice touch of a large glass window, behind which was the kitchen. Gipponi was there along with his staff busy working on dishes. Given the weather was so great, I asked if I could sit outside in their small garden patio. It was a tad windy but the sun was too inviting not to sit there. There were several options for lunch, 9, 7 and 5 tasting courses. While both the 9 and 7 looked good, I opted for the 5 course. I had already informed them of my garlic allergy, which they had assured me was not a problem. 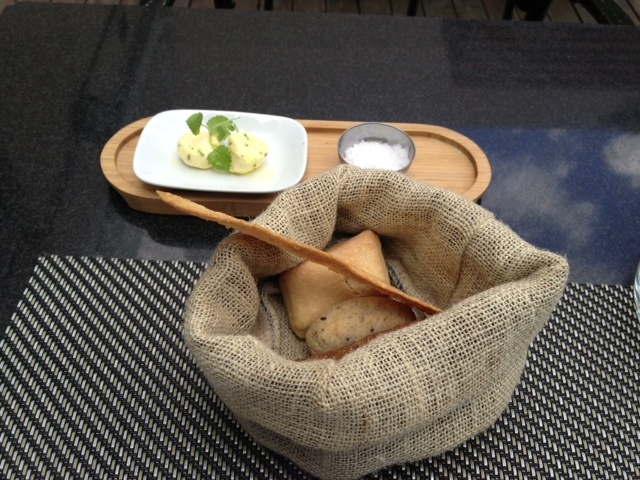 Like everywhere else I’ve eaten, the meal started with bread – a nice assortment, pipping hot along with an herb butter. I declined the wine pairing option given that I did have to work after this and went ala carte from their pretty extensive wines by the glass. Presented to me on an iPad, I selected the champagne made with a 80/20 blend of Chardonnay and Pinot Noir. It was nice and cold – a great way to start my meal. The first course soon arrived, which was different than the one on the menu due to my garlic issue. While I have no idea what I missed with that course, my course was amazing. The picture below doesn’t really show the main component – a perfectly cooked large prawn – nor the fantastic “24 hour cooked” tomatoes that really enhanced the flavors. This was surrounded by arugula and other field greens along with some almonds – very Spanish, which made sense given that Gipponi had been a chef there in the past. If this was how good every course was going to be, I thought, then I was in for a truly special lunch. 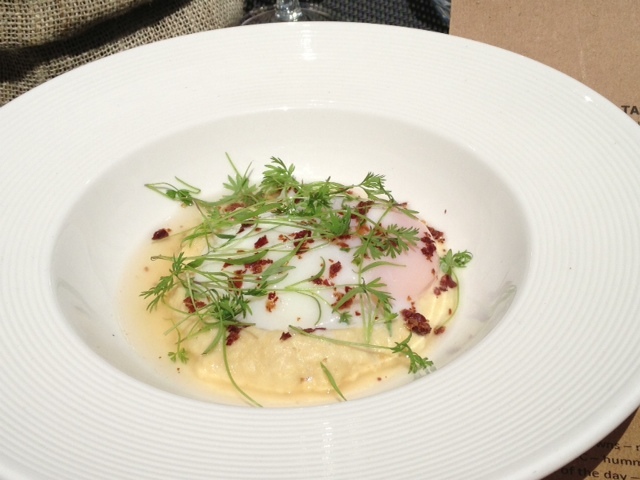 The next course would have made my dad very happy but it made me quite happy as well – Eggs 62 with hummus and crispy bacon. For those not familiar with the egg 62 technique, this is a cooking method where the egg is cooked at precisely 62 degrees C, at which temperature there is no difference between the white and yolk. It’s extremely difficult to pull off correctly but this version was excellent. I’m not a big fan of hummus normally but mixed with the eggs and the crispy bacon, it made for a nice textural change. Next up was the Catch of the Day – in this case, white salmon. Underneath the salmon was the same delicious tomatoes cooked 24 hours along with a very unusual sauce made with mussels. There were also two mussels along side. This was probably my least favorite course but it was still very good. 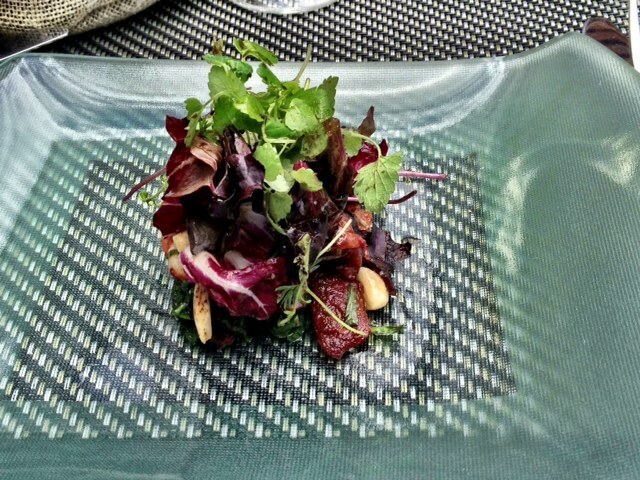 The salmon skin was nice and crisp, and the tomatoes once again brought me back to Spain. Before the next course, it became a bit too windy to stay outside plus there was a stubborn wasp that wouldn’t leave well enough alone. I picked the table closest to the garden so I could still get some of the al fresco feeling. As it turned out, the guy sitting next to me with his laptop was the Director of the hotel. He told me how the restaurant had taken awhile to get going as the chef wasn’t known locally but that it now had become quite popular. They do regular wine tasting events with a DJ and are about to shift the tasting menus to be changed every 2 months vs. 3-4 times a year. 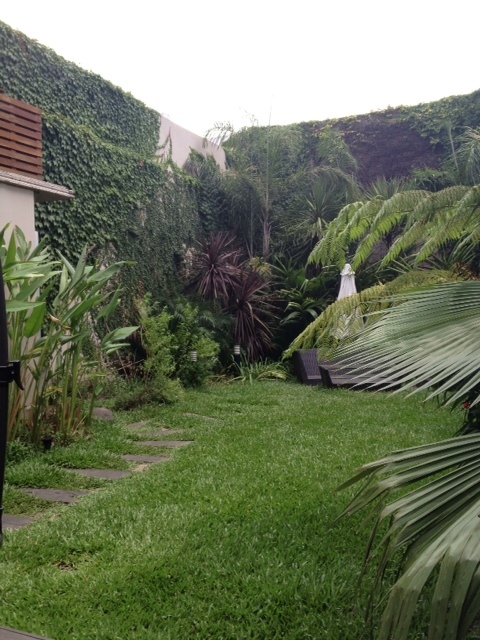 He also gave me some suggestions for places to try before I left Buenos Aires. Since the next course was loin of lamb, I switched to a Mendoza based Malbec, which the Director suggested as a nice pairing. 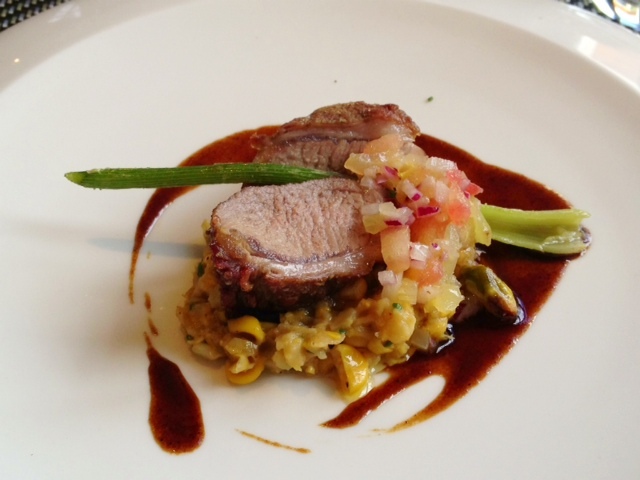 The lamb was on a bed of risotto along with a Cabernet sauce and some pickled vegetables, which added a nice acid note to the pretty rich dish. This was definitely a winner too. I had read about this famous dessert and while not a big cold fruit fan with my sweets, I was still curious to see what it was like. Oh my goodness was this incredible. Strawberry granita with mixed fruit and lulo mousse. 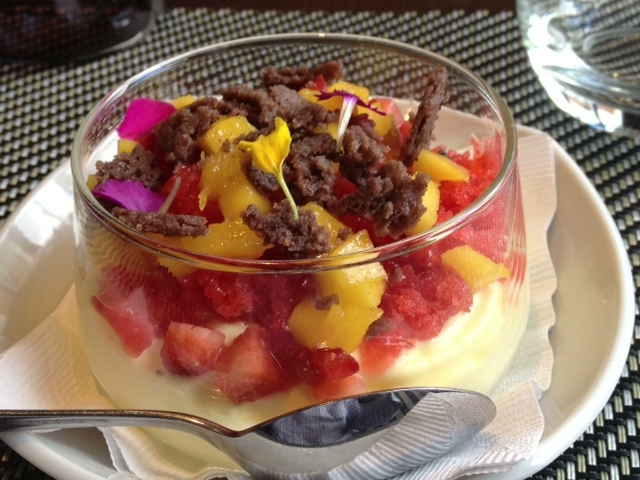 The Director told me that lulo is a Colombian fruit that they then turn into a whipped yogurt-like mousse. Every bite had different textures and flavors. One of the best desserts I’ve ever had. 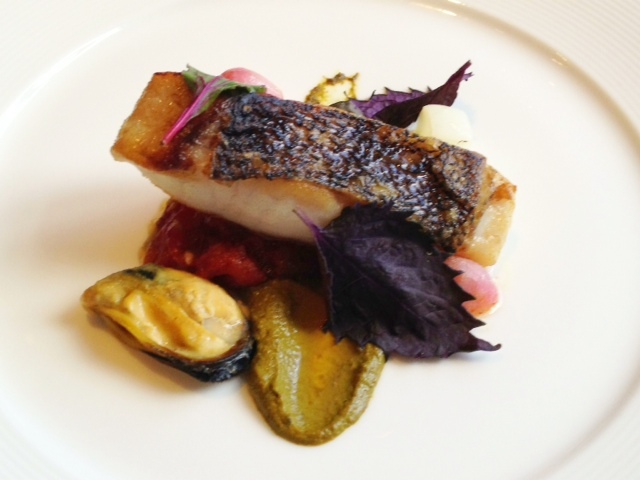 All and in all, it was a truly spectacular lunch, one for the ages. Two hours plus after arriving, I staggered out of the hotel and headed back to my loft for a much needed siesta. Posted on January 26, 2013 by reyalto. Bookmark the permalink.